Sandy Key’s beaches are forever protected by the neighboring National Seashore Preserve. If you prefer your walks on the beach, solely in the company of the sea gulls, Blue Herons and sea shells, then Sandy Key is the place for you. Sandy Key is located on 800 feet of Beach Front. This ground floor unit has 1219 SF of living area and a 200 SF beach front balcony. 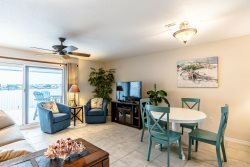 Walk directly from your private balcony to pools, hot tub, grilling areas and beach. Carpet throughout Living, Dining and Bedrooms with Ceramic Tile in Foyer, Kitchen and Baths. Electronics include 55” TV, DVD in Living Room, 32” TV, DVD in Master Bedroom, 32” TV, DVD in Guest Bedroom. The team at Perdido Realty Vacation Rentals is always amazing! We love Perdido Key and the Sandy Key complex. This was our 2nd year in a row to visit and we will be back! The beaches are amazing and the water was so calm on this visit. Sharon was a great help! Everyone very nice and willing to help!! I love this unit!! Easy access to everything. And love being on 1st level, no dragging everything up and down elevators! Absolute best We have ever stayed at!! Will be returning and have stayed the last 2 years here. very peaceful and quit and everyone is very nice.